Our Group is developing high stability, high accuracy optical atomic clocks based on thousands of Yb atoms confined to an optical lattice. Such clocks will find applications in tests of fundamental physics and ultra-precise timekeeping, and might one day contribute to a new definition of the second. Due to their high oscillation frequency (~1015 Hz) optical clocks can achieve extremely high spectroscopic line Q's in appropriately prepared atomic samples. As a result, such clocks are reaching levels of clock performance that are orders of magnitude better than was possible only a decade ago. Of particular promise are clocks based on laser-cooled neutral atoms that are confined to an optical lattice, which suppresses Doppler shifts and is designed to minimize clock shifts. 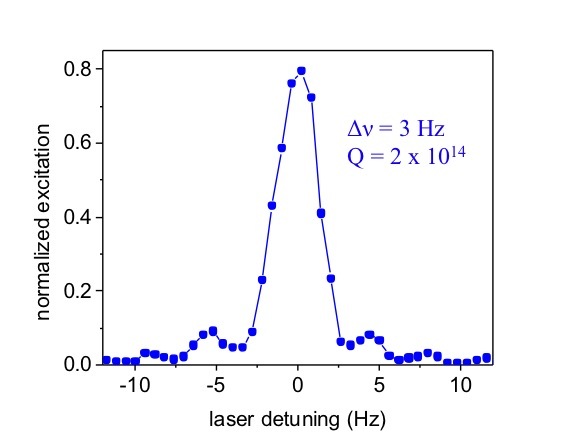 In our experiments we have trapped tens of thousands of 171Yb atoms, which have an ultra-narrow transition at 578 nm that we excite with a pre-stabilized laser. We lock the frequency of the probe laser to the spectroscopic feature, which can be as narrow as 1 Hz (full width- half maximum). Through comparisons between two such Yb lattice clocks, we have demonstrated a fractional clock instability for averaging time, τ, of 3 x 10-16 τ-1/2, reaching an imprecision of 1.6 x 10-18 after about 6 hours. A previous evaluation of the fermionic version (171Yb) of the Yb lattice clock yielded a total fractional frequency uncertainty of 3 x 10-16, however we anticipate a significantly reduced uncertainty in the near future. Of particular experimental interest is the minimization of clock shifts due to blackbody radiation from the lattice surroundings. The NIST Yb lattice clock advanced atomic clock stability to a level ~ 10-18. Apply for an NRC postdoc in optical atomic clock or fs-laser frequency comb research. Application deadlines are February 1 and August 1 annually (but inquire well in advance). Summer program at NIST-Boulder for undergraduates in science, engineering, and mathematics. The application deadline is February 15 annually. Our Group has periodic openings for Postdoctoral Fellows, Visiting Scientists, and Graduate Students. Please contact us for more information.